Turns out, I missed cooking, so after dropping B off at the airport, we headed straight to the store to prep for the week! Paleo Week 2, here I come! Our friends invited us over for “make your own pizza night,” so I grabbed smoked meat and green beans from my favorite BBQ place and headed over. I ate my meal as planned, as did Bryson. Matthew ended up making a pizza… and loving it. I sampled a small bit of his and it was good. They had homemade ice cream for dessert so I went for it – a small dish. Good, but not worth the calories or deviation from our plan. My very helpful neighbor watched the kids so I could hit a 4:30 kickboxing class. When I returned to get them, she was feeding them dinner (she’s like that – just takes over which is so helpful!) and I was out of luck. I was going to make the Greek Chicken from week 1, but it would have to wait until Tuesday. So, I picked through the fridge, found some turkey, milk, and a cheese stick. Awesome. Because Matthew had speech downtown at 5:30, I decided to make the whole Greek chicken for lunch and then just eat the leftovers for dinner after speech. This plan did not work out – the boys at 3/4 of the 4 pound chicken and left me just one breast. Bryson ate all but6 spears of my roasted asparagus. It was a light lunch (HA!). With my leftovers plan thwarted, I was left to figure it out on the way home from speech. We went to Chipotle. The kids were both being so difficult, that I took the hit and got tacos (soft corn) so I could eat with my hands and not have to worry about forking up my own food while trying to feed and contain both kids. It was good (no GREAT)! When you’ve got an easy, outstanding recipe at your disposal, why not take advantage of it? I made these awesome sliders again tonight, served with green beans (none of us ate them, they were so tough and awful) and bib lettuce. They were GREAT! I just love this recipe! I had 3 of them equaling 6 ounces of meat. The boys split one, leaving 2 for tomorrow’s lunch! This was just as good reheated as it was fresh. I swear, I could eat this recipe every single day! I had 2 patties left (each with 2.67 ounces of meat) and reheated them together for 2 minutes on 40% and they were juicy and awesome! I didn’t have any veggies to have with it, but the lettuce did the trick for me. We ate early, so the rest of the evening consisted of snacks (milk, cheese). This little dandy didn’t come from our normal cookbook – it just happened to be in our grocery store publication (it’s a rather fancy store with it’s own quarterly food magazine) and it just happens to be Paleo (within reason – it has maple syrup which is allowed on special occasions). So being the lovers of shrimp, and spice, and bacon that we are, this was put into our rotation immediately! It was AWESOME! I would make this again and again. The sauce is to die for – and it’s just 1/4 cup of pure maple syrup and 2 TBSP of Srirachi sauce – that’s it. Back in the day, B and I would go to a brew pub at least once a week for a shrimp dish that we both loved – we’d order two rounds of it for our appetizer because we couldn’t stand sharing just one serving. They took it off the menu and B’s been sad ever since. 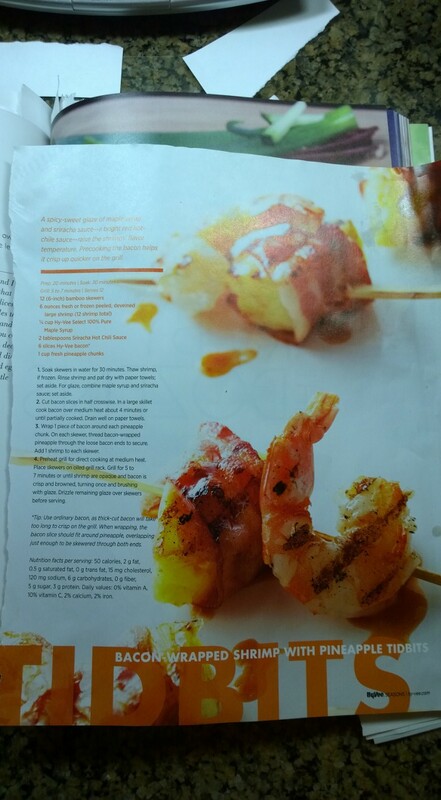 I told him tonight (he’s still out of town) that we can now make it at home – this recipe tastes just like that fabulous appetizer, but has grilled bacon and pineapple as a bonus. Hell yes! B got home today so we went out to dinner. We both wanted to end the week well so chose Joe.s Cr.ab Sha.ck for two of their healthy options. As B always says, we can cook much better meals at home, and he’s right. I had the Malibu shrimp (no rice, add broccoli) which was fine, but not great, and B had mahi. 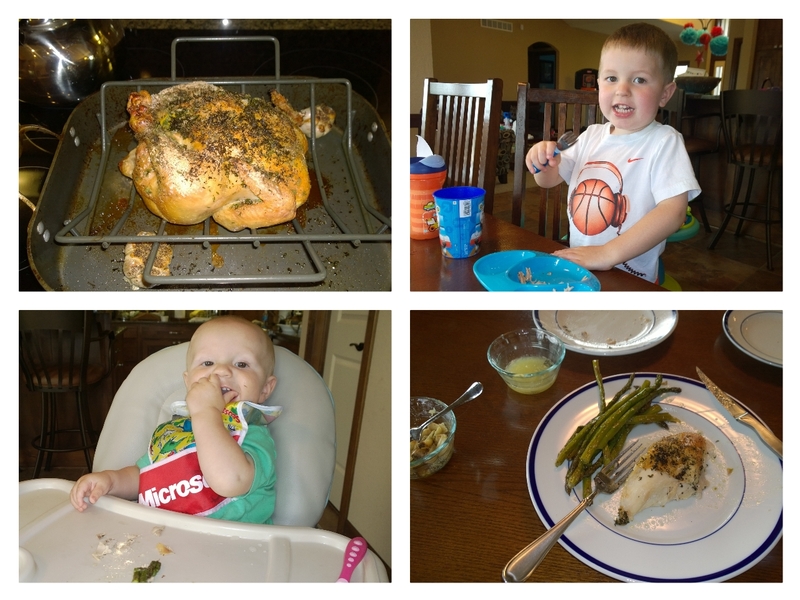 The kids ate grilled white fish and DEVOURED it, so that’s a positive from our experience! We all went to a lakefront then to feed ducks which was super relaxing! It was a pretty solid ending to a *primarily* paleo week (because I had those tacos and a kids cup of vanilla soft serve from DQ earlier in the week). Noteworthy Points: I’m finding it easier and easier to prep and cook dinner – and it makes me happy to do it! I feel like a better mother and wife, which sounds ridiculous but it’s true. I have stepped up my fitness plan just because I need a break from my kids with B out of town all week – so the YMCA and long walks it is for Bryson and me while Matthew is at camp. I only did the Y one day, and the walk for two days, but it was nice! I also took Bryson to kickboxing with me twice this week which worked out once, but was a colossal failure on Friday (we left early). How I feel: TIRED. Bryson is having a hard time at night with teething and an awful cold – so I’m just exhausted. I was actually relieved when we had to leave kickboxing early on Friday. Besides being tired, I feel really good! My body is very sore from the near-constant exercise (and new shoes) which is good, but still painful! I have been inspired by your eating 🙂 and the fact that I am going to Port Douglas for two weeks in three weeks and for the first time in months I feel like a fugly mess (thanks IVF!!). I figure I have three weeks to drop 2kg and the best way is to clean my eating up (it’s winter here ya know!). Last night I made thai chicken burgers with a salad AND OMG THEY WERE INSANE. I just had them for lunch and they were still amazing. Those burgers sound amazing! You should post the recipe! It’s been super fun cooking and eating better – I just wrote a whole post about how it’s made me feel. HA!